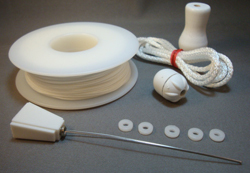 Hunter Douglas Tassel Condenser, 1 Plastic Washers,1 White or Alabaster 2.2mm Pull Cord (4 foot long) and, 1 White or Alabaster Plastic Tassel. 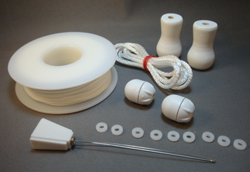 Metal Ball Condenser, 1 Plastic Washers,1 White or Alabaster 1.8mm Pull Cord (4 foot long) and, 1 White or Alabaster Plastic Tassel. 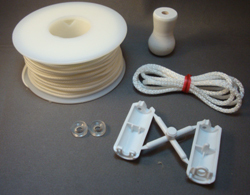 Order the String and Parts you need to make your own restring kit. For all your RV end cap and cord retainers. Please CLICK HERE.